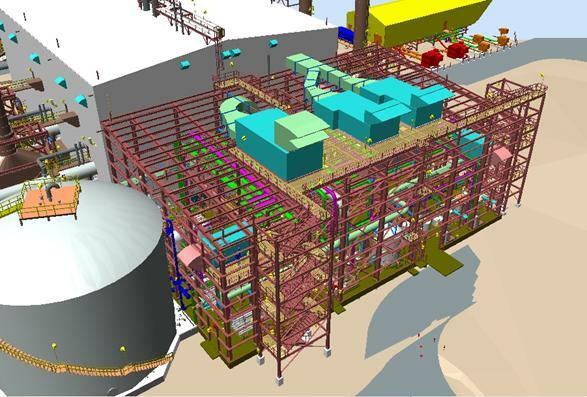 This guideline is intended to be used as supplementary document to NBCC2005 for the seismic design of petrochemical facilities in Canada, with particular focus on Northern Alberta Fort McMurray area. This document only covers Equivalent Static Force Procedure (ESFP), which is the easiest and most applicable way to implement seismic design in low seismic zone like Fort McMurray area. There is no provision on seismic design of Nonbuilding Structure in NBCC2005. ASCE 7-05 Chapter 15 Seismic Design Requirements for Nonbuilding Structures is referenced for Nonbuilding Structure seismic design in Canadian location. When ASCE 7-05 is referenced, NBCC2005 version of ground motion parameters is used to interpret the ASCE 7-05 formula. This is what NBCC2005 recommends in Commentary J page J-61, Para. 226.
? 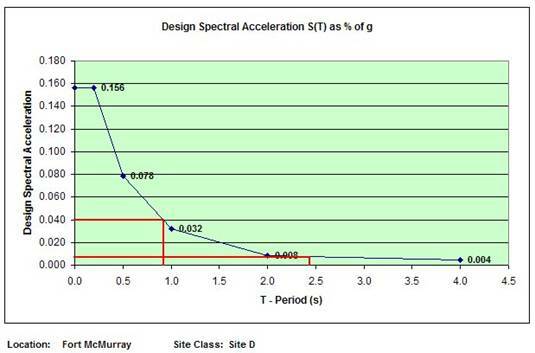 5% Damped Spectral Response Acceleration? For most projects in Fort McMurray, average shear wave velocity is 200~300 m/s, and the Site Class is Class D.
In Fort McMurray, for the highest importance category Post disaster structure, Site Class D, IE Fa Sa(0.2) = 1.5x1.3x0.12 = 0.234 < 0.35?
? For Site Class D or better, ESFP can be used as the seismic analysis method for all structures in Fort McMurray area. Not covered in this guideline. 1. NBCC2005 4.1.8.11 (3) allow the use of estimated period for seismic calculation. Computed structure period via computer model is not absolutely required. 2. Most of the time, the computed period is much longer than estimated one. This is due to the fact that formula for estimation given by code always leans to the conservative side. Using computed period instead of estimated one gives us the advantage to reduce the seismic base shear. Below is a comparison of S(T) value based on estimated Ta and computed Ta, from Example 01. 3. NBCC2005 4.1.8.11 (3)(d) sets the upper limit? on using longer computed period, considering that the actual structure may be stiffer than the model in STAAD. For example, mechanical equipments, pipings, cable trays etc are conventionally not modeled in STAAD while they may actually contribute to the stiffness of SFRS system. NBCC2005 focuses mainly on residential/commercial buildings, for industrial facilities there are mostly open structures and less partition wall cases. In high seismic zone, should there be a demand for reducing seismic force to achieve a an economical design for industrial structures, engineering judgment is required to identify if this upper limit is applicable, when the engineer is confident that the computer model can reflect the actual SFRS stiffness and give an accurate period.
? NBCC 4.1.8.13 (3) specifies storey drift limit 0.025h for normal buildings. 0.025h is an allowable limit for inelastic storey drift, which is applicable when seismic force is not reduced by dividing RdxRo factor. seismic load scaled down by IE/( RdxRo). In high seismic zone, the total seismic load can be more than 20 times of total wind load. It?s almost impractical to design a structure deforming elastically with seismic lateral load 24 times of wind load. RdxRo factor is used to reduce the seismic forces in recognition of the fact that a ductile structure designed based on the reduced forces is able to dissipate the earthquake energy through inelastic deformation without collapsing. In high seismic zone, higher ductility of SFRS is more desirable. If Ductile SFRS is used, RdxRo =5.0x1.5 for moment frame and RdxRo =4.0x1.5 for eccentrically braced frame, the seismic force for design can be reduced to? 8270 / (4.0x1.5) = 1378 kN , which is more comparable to wind load, 341 kN. The tradeoff of higher ductility for SFRS, is the steel member and connection design requirements. 5. Ductile moment resisting connections for seismic application must satisfy more rigorous design and detail requirements. Moment Connection shall be pre-qualified connections and designed as per CISC publication Moment Connections for Seismic Applications-2008, which contains design procedure of three types of pre-qualified moment resisting connections. From above we can see that, once SFRS is covered by S16-09 Clause 27, the increased complexity of SFRS frame member sizing, frame analysis, connection design and detailing, steel facbrication and erection is tremendous. In low and moderate seismic zone, Conventional Construction is an advantageous design option to waive all provisions in S16-09 Clause 27, except clause 27.11. In low seismic zone like Fort McMurray, the low ductility of Conventional Construction SFRS will not cause significant increase to member size, as the seismic load is normally lower or comparable to wind load, even using the lower reduction factor RdxRo value of Conventional Construction. With Conventional Construction, design seismic load reduced to 823 / (RdxRo) = 823 /(1.5x1.3) = 422 kN, which is already close to wind load 341 kN? ? use of higher ductility SFRS is not necessary. In Fort McMurray, always use Conventional Construction, RdxRo = 1.5x1.3, for all SFRS systems. Seismic provision in NBCC2005 is written predominantly to address residential and commercial building structures. ?It covers the seismic requirements for Building Structure (clause 4.1.8.11 and table 4.1.8.9) and Nonstructural Component (clause 4.1.8.17 and table 4.1.8.17), but there is no provision for Nonbuilding Structure. 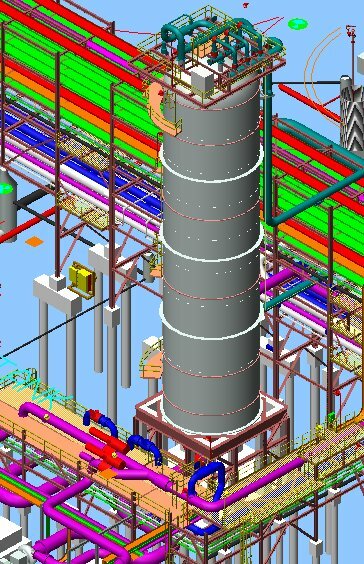 Nonbuilding Structure includes many popular petrochemical facilities, such as all free-standing vertical vessels, flare stacks, all horizontal vessels, piperacks, exchanger structures, process/equipment modules etc. ?In this guideline, ASCE 7-05 Chapter 15 is referenced for seismic design of Nonbuilding Structure. When ASCE 7-05 is referenced for seismic design in Canadian location, Canadian version of ground motion parameters in NBCC2005 are used to interpret formulas in ASCE 7-05. This is exactly what NBCC2005 suggests in its Commentary J page J-61 Para. 226. 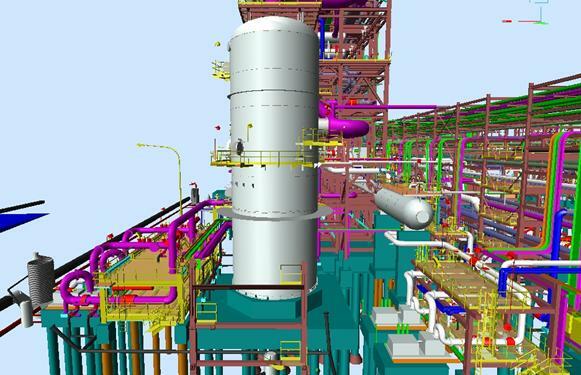 Some of the equipments, such as hor vessel, can be treated as either Nonstructural Component or Nonbuilding Structure. When a hor vessel is supported on a steel structure and it?s weight is less than 25% of the combined weight, it?s a Nonstructural Component and NBCC2005 4.1.8.17 is used to calculate the base shear, for equipment local support design only. 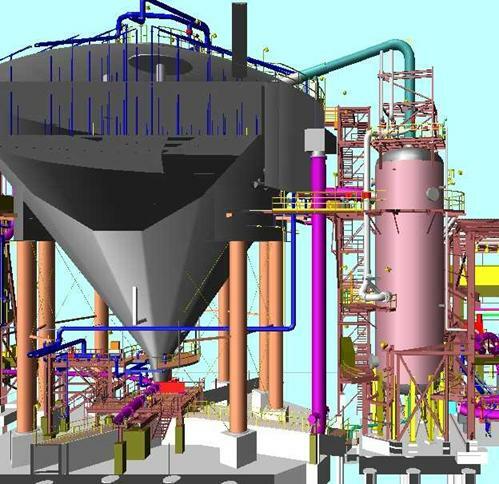 For the overall structure, NBCC2005 4.1.8.11 is used to calculate the base shear. The hor vessel weight is considered as part of effective seismic weight in the base shear calculation and seismic force distribution. Building structure seismic force shall be designed as per NBCC 4.1.8.11, with the weight of nonstructural components (Process, HVAC equipment and Bridge Crane etc) considered as effective seismic weight for base shear calculation and base shear distribution along vertical direction. Nonbuilding Structures Similar to Building seismic force shall be designed as per NBCC 4.1.8.11, with the weight of nonstructural components (Process, Mechanical equipments etc) considered as effective seismic weight for base shear calculation and base shear distribution along vertical direction.
? 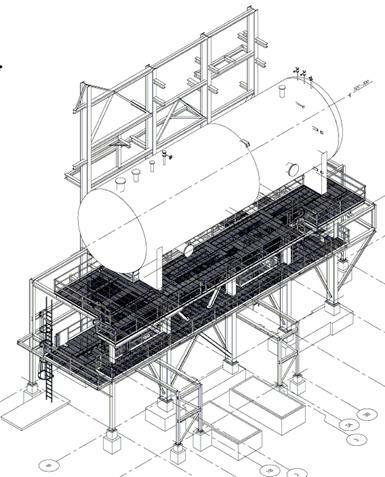 All Process, Mechanical equipments supported on a steel/conc structure with its weight less than 25% of the combined weight, shall be designed as Nonstructural Component and NBCC2005 4.1.8.17, for equipment local support design only. 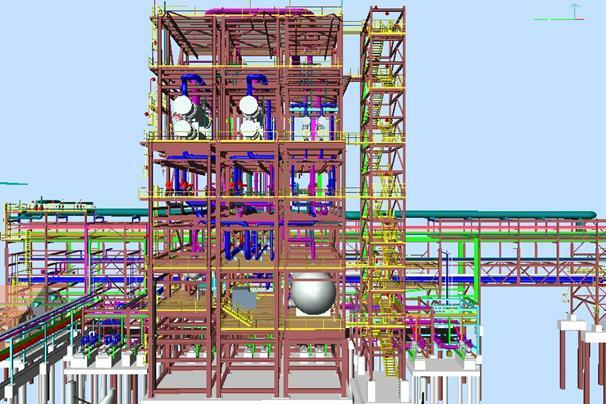 For the overall structure, NBCC2005 4.1.8.11 is used to calculate the base shear. The equipment weight is considered as part of effective seismic weight in the base shear calculation and seismic force distribution. Braced Leg Supported vertical vessel seismic force shall be designed as per NBCC 4.1.8.11, with the seismic force distributed as per NBCC 4.1.8.11 (6).
? The leg brace is normally Tension Only brace which is designed by vendor.
? The vendor will provide foundation load, including seismic case, for foundation and anchor bolt design. The engineer shall always carry on the seismic load calculation by his own and verify the vendor provided data.
? The Braced Leg Supported vertical vessel is more flexible compared to Skirt Supported vertical vessel. Engineer can use STAAD to get the fundamental period. Please note that the Tension Only brace makes the support system more flexible and will generate longer period.
? Depends on the shape of the vertical vessel, it can be classified as Sphere type or Cylinder type. The PSC vessel below is Sphere type vessel, the seismic load can be applied at mass center. The Deaerator vessel below is the Cylinder type, the seismic force can be applied as reverse triangle.
? The seismic overturn moment to vessel base shall be corrected by multiplying reduction factor J obtained from NBCC Table 4.1.8.11.? This is due to the fact that the higher mode forces, Ft , make a much smaller contribution to the storey and base overturn moment. Nonbuilding structure is not covered in NBCC2005, ASCE 7-05 15.4.2 Rigid Nonbuilding Structures is referenced. Supporting structure seismic force shall be designed as Building Structures or Nonbuilding Structures Similar to Building as per NBCC 4.1.8.11, with the weight of nonbuilding structure considered as effective seismic weight for base shear calculation and base shear distribution along vertical direction. Calculate the seismic force for an exchanger structure supporting stacked heat exchangers as shown on next page. Frames along GL1,2,3 are moment frame. Frames along GLA, C are braced frame. Frame along GLB is unbraced. Single exchanger shell operating weight 500 kN, each floor equipment effective seismic weight = 4 x 500 = 2000 kN. Assume each floor has 20m long 20? dia pipes to be counted for effective seismic weight. 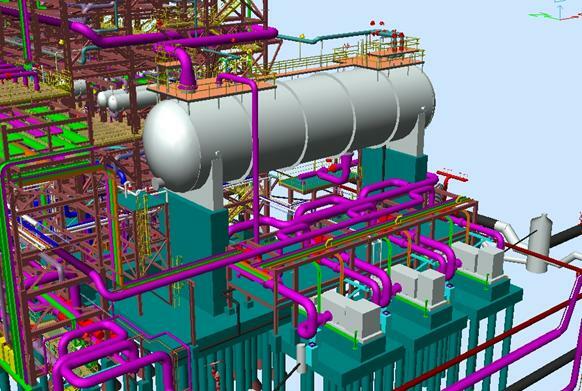 Structure importance category = High as the exchanger contains flamable hydrocarbon content. From above seismic base shear calc, we can find that, in low seismic zone such as Fort McMurray area, using Conventional Construction (CC) is good enough to bring the lateral seismic force down to a magnitude comparable to wind load, 341 kN.
? the requirement of clauses 27.1 to 27.10 and 27.12 shall not apply to these systems. In low or moderate seismic zone, using a higher RdxRo modification factor is not necessary as it will trade the convenience of non-seismic connection design for nothing. With the use of response reduction factor RdxRo under Conventional Construction, the seismic load is already comparable to wind load, and in many cases, seismic load is actually lower than wind load. 341 kN. One may argue that the wind load still govern when it goes to the load combination considering wind load factor of 1.4, and seismic load factor of 1.0, but actually in many cases the seismic load will govern in the design of petrochemical structures in Fort McMurray area. From above seismic base shear calc, we can find that, in high seismic zone such as Vancouver, using higher modification factor of RdxRo is absolutely necessary, otherwise the huge seismic lateral load, 8270 / 341 = 24 times of wind load in this case, will create an impractical structural design. In this part the equipment is taken as a Nonstructural Component and its seismic force is calculated as per NBCC 4.1.8.17. This seismic force is used for the design of local equipment support only (steel support for exchangers). For equipments at foundation level Ax = 1.0, and Ax = 3.0 for equipments sitting at roof level. From above we find that, for local equipment support design, the seismic load is much bigger than the wind load if the equipment is located on a higher elevation above grade. This is mainly due to the dynamic amplifying effect (Ar =2.5) for big mass sitting on a flexible supporting structure. It?s incorrect to conceive that in Fort McMurray area the wind load will govern structural design and the seismic load is negligible compared to wind load. In this case the seismic load can be 243/4 = 61 times bigger than the wind load. Vessel diameter = 7.189 m?????????????? In this case, the overturn moment caused by seismic is 2 times of the overturn moment caused by wind. This is mainly due to the reverse triangle distribution of seismic load. The PSC vessel is a cone shape, diameter varies from 0m to 32m along the 30m vessel height. To simplify the wind load calculation, assume it?s a dia=16m H=30m cylinder vessel, which gives the same projection area for wind load calc. Use Master/Slave to define the top support plane as a rigid diaphragm. Use the central node as a master node, the central node needs not to be physically connecting to the surrounding nodes. Vessel diameter OD= 3.683 m???????? Insulation thk = 50mm?????? Crane bridge wt = 8600kg???????????????? Trolley + hoist? wt = 1365kg?????????????? Calculate the seismic force for a vertical surge drum supported by a steel frame table top. Vessel diameter D= 7.550 m = 24.770 ft??????? It?s also risky to assume that the vendors? calculation will take care of the seismic design. The vendor?s seismic calculation always assumes the vessel base is fixed, as the vendor never has intension to get the boundary condition of support structure. In this case, when vessel weight exceeds 25% of combined weight, the vessel and supporting structure shall be modeled together in a combined model to get the accurate response of seismic load.